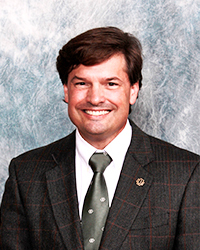 Professor Anthony Lilles has assisted in the formation of clergy, religious and lay leaders since 1994 in Colorado and California. After completing studies at Franciscan University of Steubenville in 1987, he made a pilgrimage to Rome to pursue the ecclesiastical licentiate and doctorate in spiritual theology from the Pontifical University of Saint Thomas Aquinas (the Angelicum). 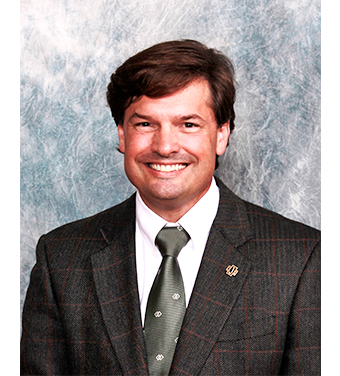 A published author, his specialty is the mystical tradition of the Church and he has recently founded the John Paul II Center for Contemplative Culture to promote this teaching. 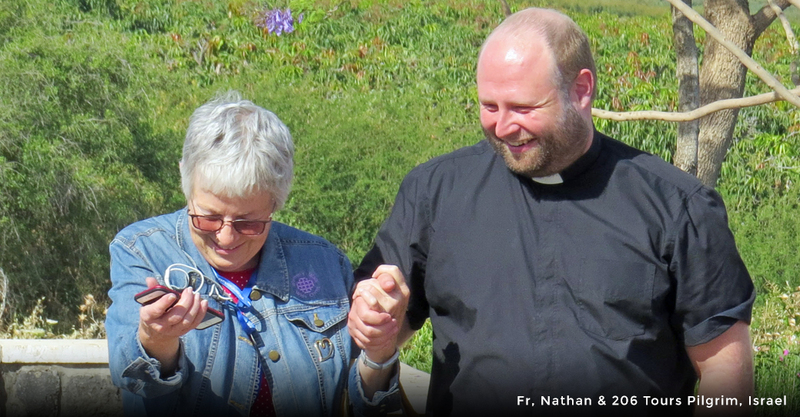 Married and having raised three children, he enjoys writing, giving retreats, and leading pilgrimages that explore the wisdom of the saints throughout Europe and the Holy Land. He is convinced that journeys undertaken out of devotion to the Lord are powerful moments of conversion and spiritual renewal. 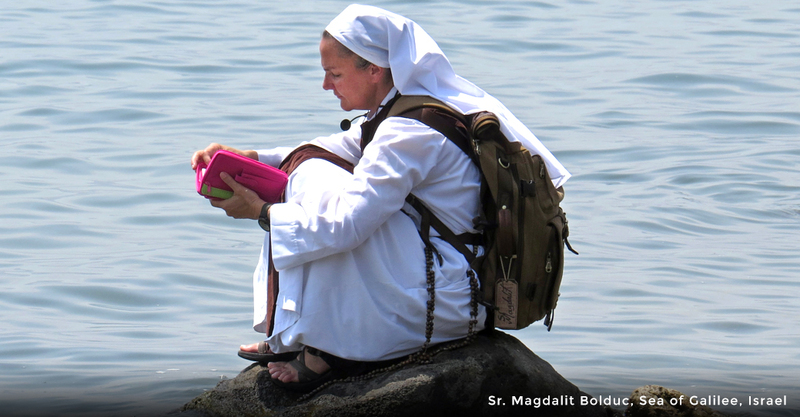 Dear Pilgrim, I invite you prayerfully to discern joining me in undertaking a once in a lifetime journey with a remarkable woman of faith, Sr. Magdalit of the Community of the Beatitudes. 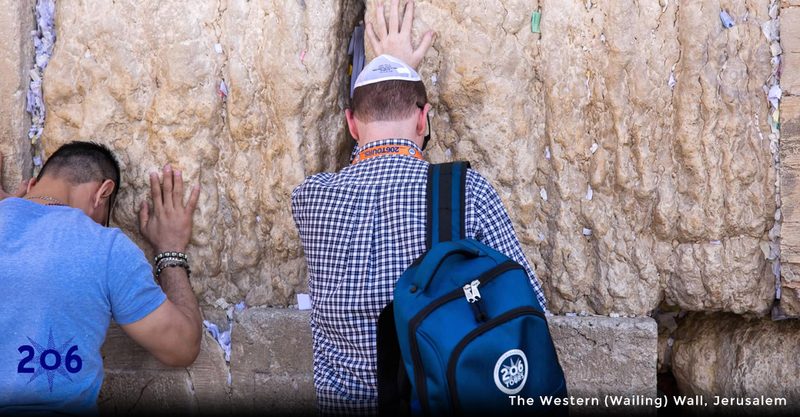 Her years of lived experience in Israel and leading pilgrimages throughout the Holy Land will avail us of unique opportunities for prayer, spiritual teaching, and fellowship. 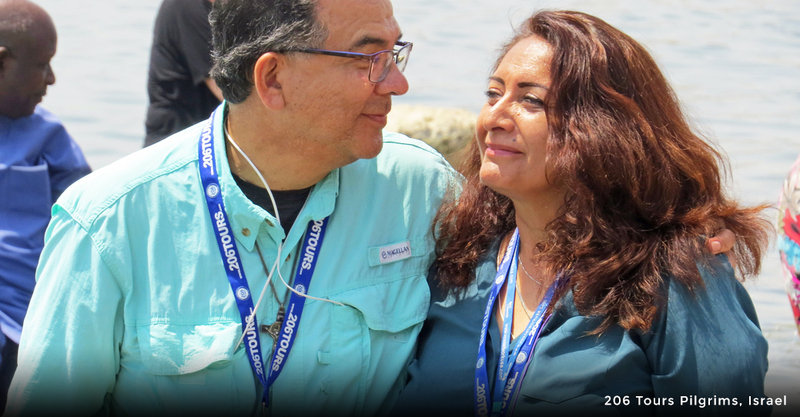 Together, we hope to lead you into a new encounter with the great mysteries of our faith and a renewal of your devotion to the Lord. Our eyes will see and our hands will touch the great marvels that live among the people and in the sacred geography on which God was born, walked, died and rose. I hope that the Lord calls you to join us. 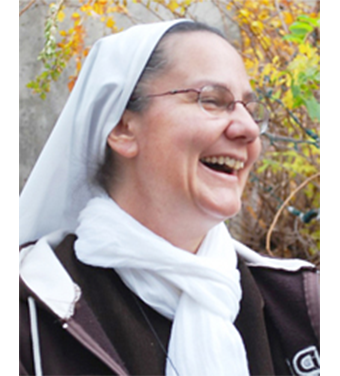 Sister Magdalit has served as a consecrated sister of the catholic community of the beatitudes for 28 years. She is bilingual in Hebrew. 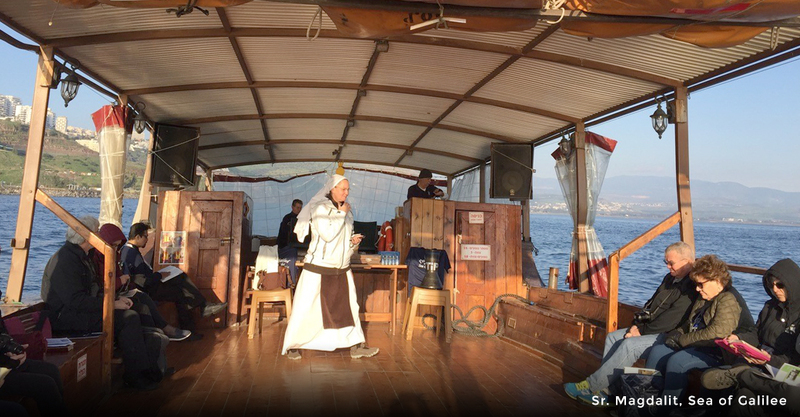 Sister Magdalit lived in Israel for twelve years, and has guided pilgrimages there for over 22 years. 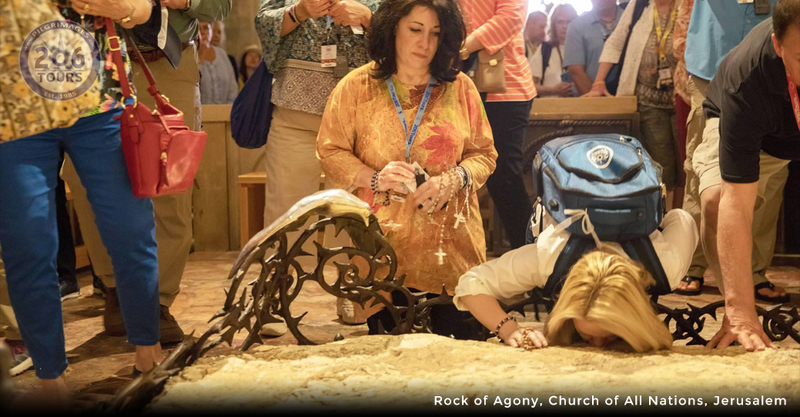 Last April, she was appointed liaison to the Jewish community for the archdiocese of Denver, and she joyously developed a ministry talking to Catholics about the Jewish identity of the Christian faith, and talking to Jews about Catholicism. 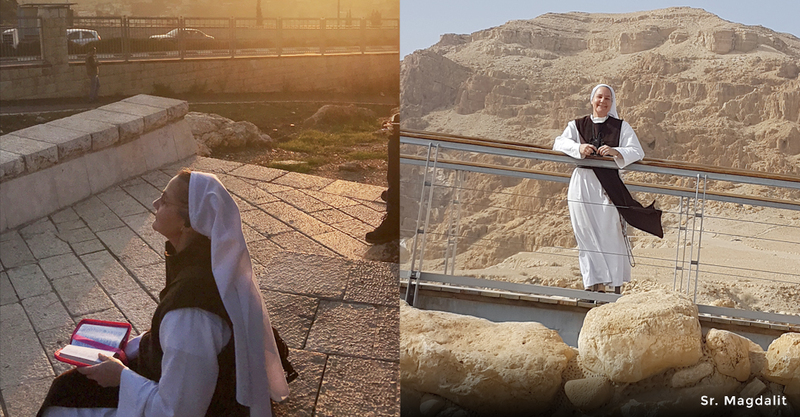 Given her extreme knowledge of the bible, Jewish tradition and the holy land itself, she will certainly provide a deeply prayerful pilgrimage experience. Wine and Beverages with lunches and dinners, Tips to your guide & driver. Departure for your overnight flights to the Holy Land. Arrival at Ben Gurion Airport. We'll be met by our representative. A luxury motor coach will transfer us to the Negev, 18 miles from Beer Sheva (Gn21:25), towards Arad (Judges 1:16) our destination. 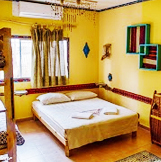 We will overnight in Kfar ha Nokdim a typical and original Bedouin Style Guest Rooms in the desert. Dinner, time for settling in, late Mass. Special readings adapted to Elijah in the desert. After breakfast, the coach will leave us at the head of a trail for an hour walk. 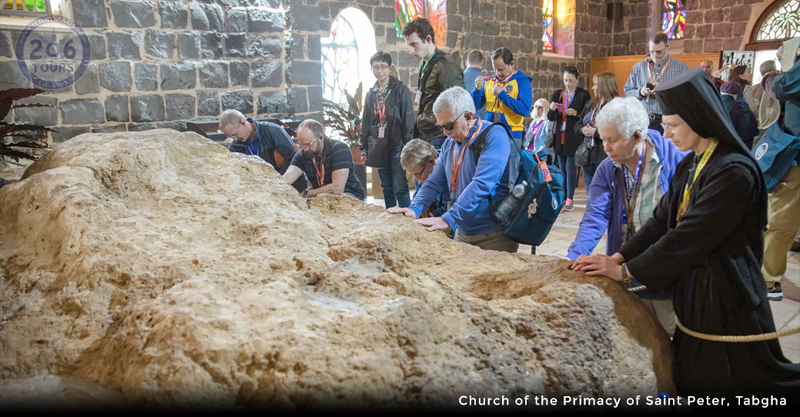 we'll take a route in a magnificent rocky landscape, perfect to reflect on God the Father's promises through his prophets and Elijah's ministry (1kg 17). Mass in the wilderness (open air). 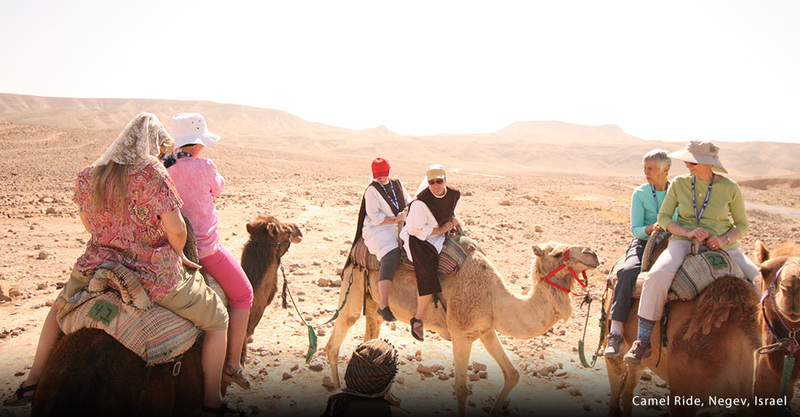 In the afternoon, the coach will drive us on the Arava side (Ez47:8-12). Drive along the Dead sea to Ein Gedi, a beautiful oasis in the region were King David hid while fleeing Saul (1Sm24:2). Time of teaching and Scripture reading. We will meditate on Elijah and his encounter with God (1Kg 19: 1-14). Finish the day in the beauty of the desert. 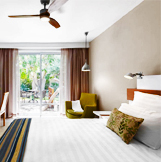 Dinner and overnight at Ein Gedi Hotel, few miles from Jericho. After breakfast, we will pass in front of Qumran (Jr32:14), the site where some of the Dead Sea Scrolls were found and go towards Jericho to the Baptismal site (Jn1:29) on the Jordan River. We will renew our baptismal vows, feet in the water, or totally immersed. There will be the shift from 'the Father to the Son' in our Trinitarian journey. From the Jordan banks, drive to Jericho where Elijah ascended in a chariot of fire (2kg 2:5-15) and were Jesus healed the blind man. We will celebrate the Eucharist at Jericho's Parish. Enjoy lunch in a beautiful restaurant nearby. After lunch, see a sycamore tree like the one of Zacchaeus the tax collector (Lk19:1-10), and continue along the Jordan Valley to Mount Carmel to our lodging. Dinner and overnight in Stella Maris. In the evening, fraternal time. In the morning we will visit the grotto of Elijah in Stella Maris. The emplacement (ruins) where the first monk started to live modeling their lives on Elijah. From there we will go up to Muhraka were Elijah confronted the 450 Baal of Queen Jezebel (1kg 18:20-40). Mass. Time of Lectio. Lunch. 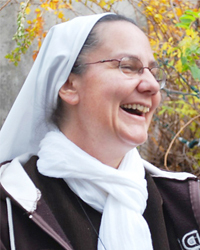 Transition with Mary: she is the one who will protect the order of Carmelite. In the afternoon, head towards Nazareth. 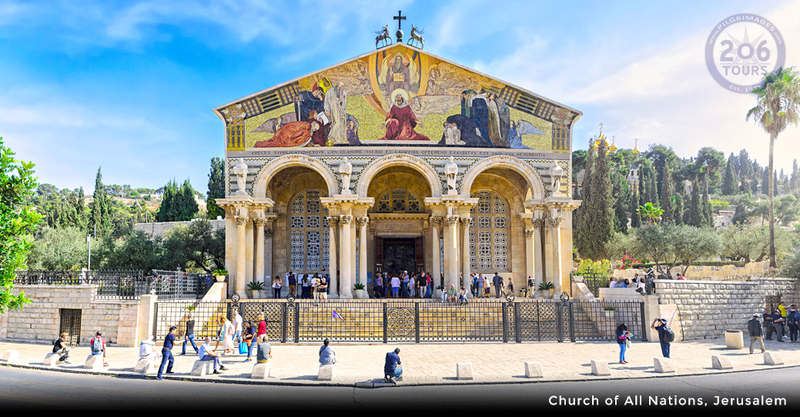 Visit the Greek Church the Fountain of St Gabriel and the Basilica of the Annunciation which is built over the remains of the House where the Angel Gabriel appeared to the Virgin Mary to announce that she was to become the Mother of God (Lk 1:26). Dinner and overnight in Nazareth. Free evening. In the morning, we will proceed to Mt. Tabor in the Jezreel Valley (Zc12:11), 11 miles west of the Sea of Galilee. According to Origen, St Jerome and St Cyril of Jerusalem, this is the site of the Transfiguration (Mt 17:1) where Jesus appeared in his Glory between Elijah and Moses. Also, the site in the first covenant, in the mid - 12th century BCE of the battle between Barak and Sisera, under the leadership of Deborah the Israelite Judge of that time (Jg4:5). We will ascend the Mount Tabor by foot in silence (1,886 feet). 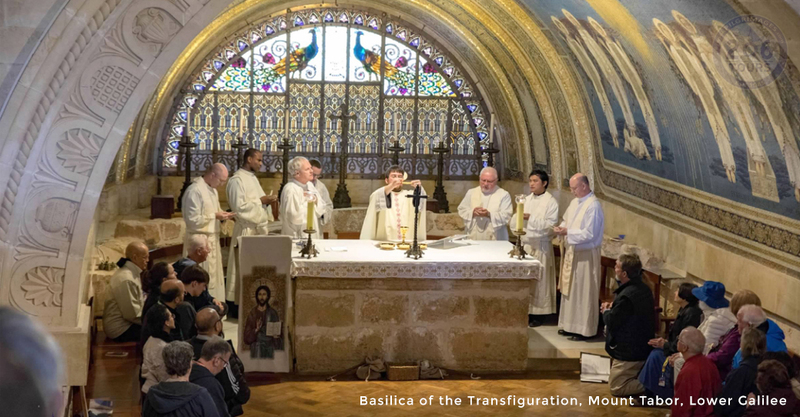 After praying and contemplating the Moso-Arab Church, a jewel of art, We will celebrate the Eucharist in this magnificent place, ponder on the person of Elijah in Judaism and his presence in the New Testament. Lunch. Descent of Mount Tabor by foot. Cana, where Christ performed his first miracle at the request of his mother is on our way to the Lake. In Cana (Jn2:1-11) we will take time to read and pray. If doable, the couples who wish too can perform the renewal of their wedding vows. After Cana, en-route for the Lake of Galilee called also the Sea of Kinnereth (Nb34:1). The next three days we will ponder on the Public life of Jesus. Dinner and overnight on the Sea shore of the Lake. Free evening. After breakfast, we will embark for a Boat ride to Capernaum. Capernaum is now in ruins but was once a thriving town where Peter lived and hosted Jesus (Mt 4:13). In this Synagogue Jesus gave the discourse on the Bread of Life (Jn 6:35-70). Drive to the Mount of the Beatitudes. 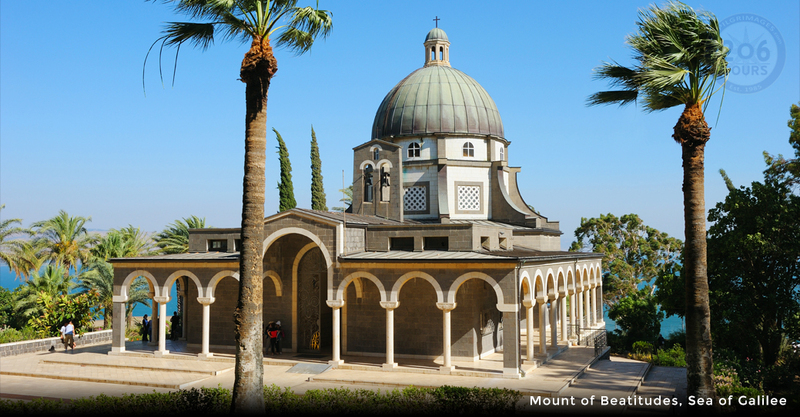 Visit the Church that commemorates where Christ taught the Eight Beatitudes to his Disciples (Mt 5). Walk down the Mount to the altar of the Beatitude grotto. Celebrate Mass in open air. Go to lunch. After lunch, the bus will drive us to the Primacy of Peter and after to Tabgha the site of the Multiplication of Loaves and Fish (Mt14). Visit the Church and its famous mosaics. 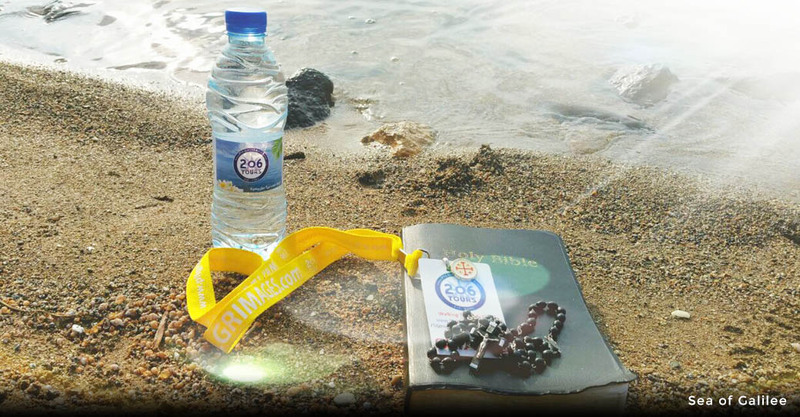 Afterward, we will have a time of adoration on the seashore (called Dalmanoutha). Back to the Hotel. Dinner. Free evening. After breakfast, we depart from Tiberias directly to Jerusalem. While ascending the mountains, we will shift from 'the Son to the Holy Spirit' in our Trinitarian journey. Make the ascent to Jerusalem while reading the Psalms of Ascent. Enter in Jerusalem and drive directly to Bethlehem. 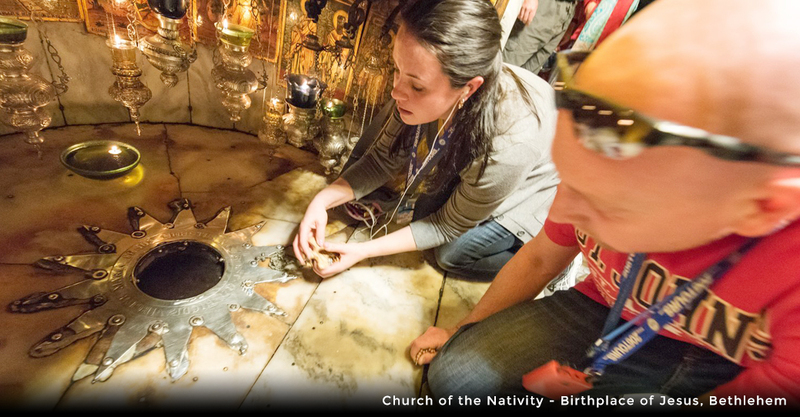 Visit the Basilica of the Nativity, built over the site of the birthplace of Jesus, born amongst the Jewish people. Visit the Cave where Christ was born and the cave of St. Jerome, who lived here for many years translating the Bible into Latin. Celebrate Mass Go to Bet Sahour for lunch. at the Shepherds field, recalling the "great throng of the heavenly hosts" that appeared to the Shepherds announcing to them of the birth of the Savior (Lk2:8). After lunch, we will have time for shopping. While driving home if time permits, stop at the panorama view of the Tayelet above the Gehenna and Kidron Valleys. Dinner and overnight at our hotel. Teaching on the Holy Sepulcher in the evening. Start the day walking through the Old City, towards the Temple area, where Jesus used to preach (Jn7:15) and where many episodes from the Bible took place (Lk2:22). Visit the Temple Mount. Time of teaching with Father. The coach will pick us up at the Lion gate. We will drive to the Mount of Olives (Mt21). 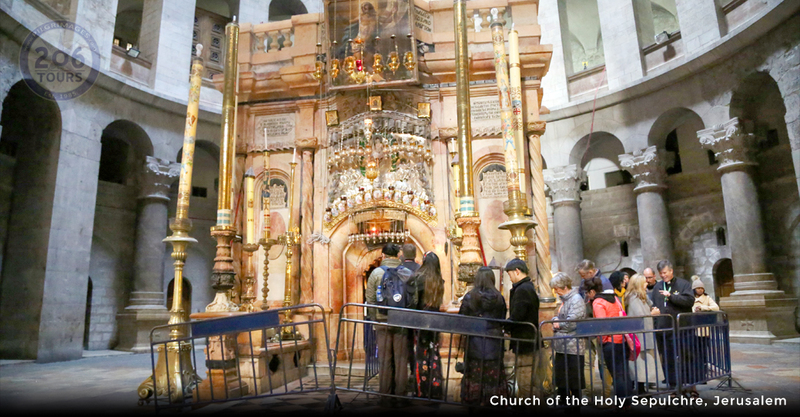 Visit the Dominus Flevit Church, where Christ wept over Jerusalem (Mt23:37). Onwards to Gethsemane reliving the descent of Mount of Olives of the Palm Sunday. 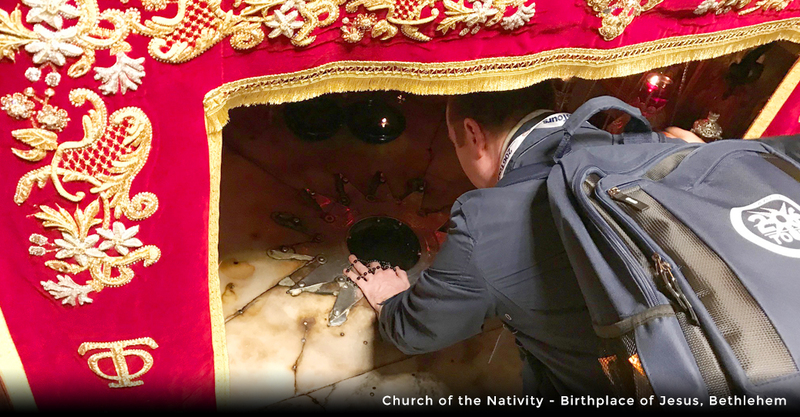 We will view the ancient Olive trees in the Garden of Gethsemane (Mt26:36) and visit the Church of All Nations which houses the Rock of the Agony of Christ on Holy Thursday. In this Church is a beautiful mosaic donated by the United States. The coach will drive above the Kidron Valley and bring us to the Zion Gate for Lunch in the Armenian Quarter. 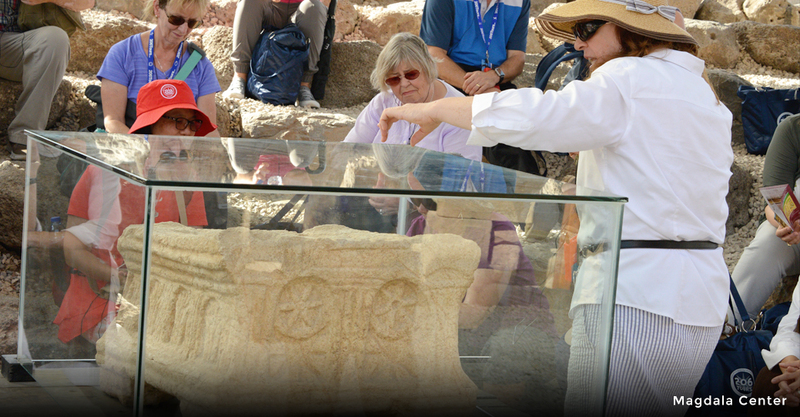 After lunch, we will head towards the house of the High Priest Caiaphas (Church of St. Peter in Gallicantu). 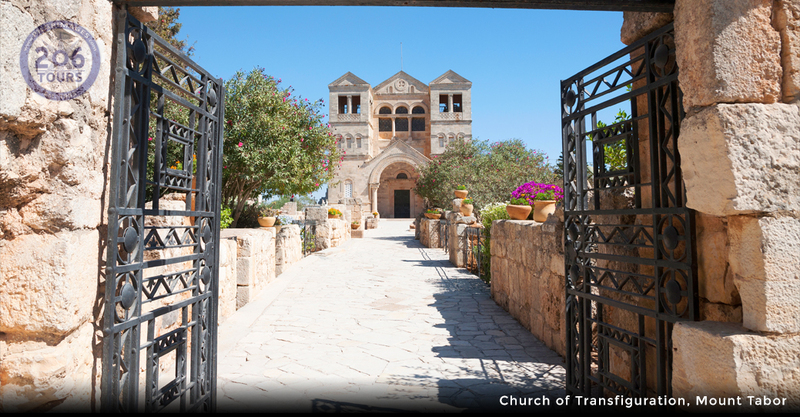 This Church commemorates where Jesus was examined and eventually imprisoned before the Council in Jerusalem. It also commemorates Peter's Denial of Christ (John 18:15 - 18). We will take a time of prayer in the cistern that served as prison. Late afternoon, the bus will drive us to the Lion Gate, for the Way of the Cross. Relive the way of the Cross. We will start at the site of the Antonia Fortress where Christ was tried and condemned to death. Proceed along the Via Dolorosa praying the Stations of the Cross - ending at the Basilica of the Holy Sepulcher, built over the site of the Crucifixion and the Tomb of Our Lord. Return to our accommodations for dinner and then make our way to the private Garden of Gethsemane for a special Holy Hour of Adoration. The day starts driving to Mount Zion. We will ask for a renewal of the Holy Spirit in the Upper Room on Mt. Zion. The Upper Room is where Jesus and His disciples celebrated the Last Supper (Matthew 26:17-30), and where they were together the day of Pentecost when the Holy Spirit fell upon them. 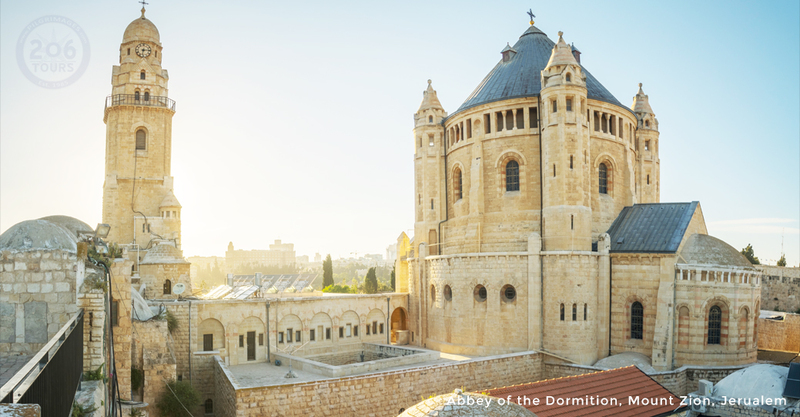 In addition, our group will visit the nearby Benedictine Church of the Dormition. Tradition tells us that this Church is where Mary, the Mother of Jesus, "fell asleep." Drive down the mountains towards North for the celebration of the Eucharist in the Holy site of Emmaus Nicopolis where the Risen Jesus met the disciples on the road to Emmaus and was recognized through the braking of the bread (Lk 24). We will have lunch served at the Monastery of the Beatitude's Community, the Community of Sister Magdalit. After lunch, we will have a time of fraternal sharing and visit this moving site. We will end our pilgrimage with a thanksgiving Mass in the antic outdoor ruins. You will see how Jesus came and revealed Himself to you during this pilgrimage as He walked at the side of the two disciples of Emmaus. Return to Jerusalem to pack our bags and overnight.